Fat transfer, or fat grafting, is a technique used by Board Certified plastic surgeon Dr. Potyondy where fat is removed from the thighs, love handles, or abdomen and transferred to your face, hands, and other areas to restore volume that is lost with age. Because the transferred fat comes from your own tissue, the possibility of an allergic reaction or rejection is eliminated, making fat transfer safe for all skin types. Additionally, fat is readily available and therefore more cost-effective than cosmetic fillers. Therefore, fat transfer is ideal for situations in which a large volume of filler is needed, such as post-surgery or post-trauma scarring, indentations, and depressions. Unlike other injectable fillers, the effects of fat transfer last for many years, if not permanently. The Surgeon Harvests Fat from the Body: Once a site on the body is selected for fat removal, a local anesthetic is injected into the site. Dr. Potyondy will then create a small incision in the area for fat removal and use liposuction to carefully extract fat in a sterile fashion. The Surgeon Purifies and Transfers the Fat: Once the fat is obtained from the site, Dr. Potyondy will process it to prepare the fat cells for transfer to small syringes that will then be used for fat injection. During the purification process, a filtration process, such as using a centrifuge to spin the fat, removes any impurities in the fat. The Surgeon Places the Fat at the Desired Area: After purification and transfer, the area to receive the graft will then be prepared. Dr. Potyondy will then insert a needle or cannula into the incision point of the area. After insertion, the needle is usually passed in and out of the areas to be augmented several times. When the needle is withdrawn, fatty tissue parcels are carefully deposited in natural tissue planes. This process is repeated until a grid of grafted fat has been created and the desired results are achieved. Patients can expect the areas that the fat was transferred to appear softer and fuller, providing a refreshed, rejuvenated appearance. Some patients even notice an improvement in skin texture. 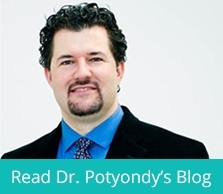 When Dr. Potyondy performs a fat transfer, the injected fat establishes a new blood supply from the body and recieves the nourishment it needs for survival. Therefore, results can and often are permanent. There is a chance that a percentage of the fat does not take, so touchup procedures are sometimes necessary.